Paula loves to play with seed beads. Well, actually, it seems that Paula loves to play with beads of all different types! But for today, I want to share some of her beautiful seed bead designs with you. 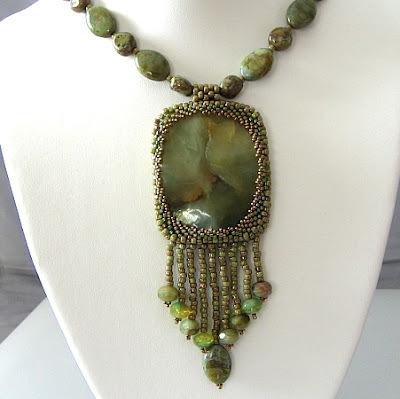 Visit Pacific Jewelry Designs to see more of Paula Huckabay's work. As a jewelry designer of many years I am always learning new things and I find myself drawn more and more to working with seed beads. It is one of the most artistic forms of beading and I love the ability it gives me to be really creative. I feel as if I am just embarking on a new path and I can't wait to see where it leads. The Blushing Ivory Freeform Peyote bracelet (shown above) is not yet on my website but will be later this month, it is away for photography for Bead Trends magazine. I was chosen as the featured designer in the March 2010 issue, a wonderful compliment! Beautiful! I hope I have the right word here, but - Paula's designs have a gorgeous organic quality - doncha' think? 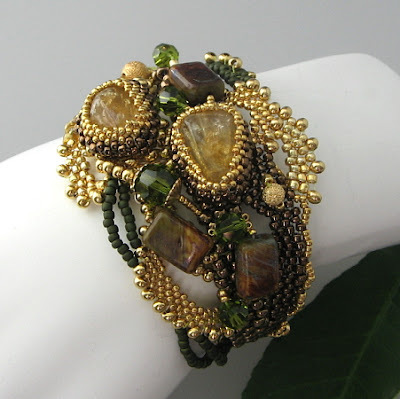 Absolutely beautiful work - I love the first green and gold bracelet! Wonderful! Beautiful work! I love these interviews, Cyndi!